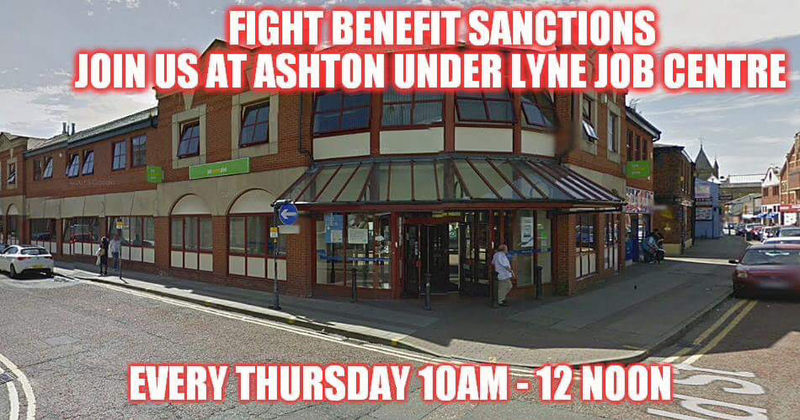 National day of demonstrations against sanctions and attempted suicide by man who attends Ashton Jobcentre. Yesterday was the national day of demonstrations against sanctions organised by unite. We of course have been doing these demonstrations every week since August. August was the turning point for us, we saw how inhumane these sanctions were and we were determined to do something about them. Sanctioning a pregnant lady for no legal reason and then saying when she asked how she would feed her unborn baby “tough your not Ill you are pregnant get on with it” still haunts me.Without the help that she got both her and her unborn baby could have been yet another statistic for this government to use in their “return to work” statistics. Make no mistake the Jobcentres aren’t there to find you work anymore. Unlike the old days. They are now used to take people off the unemployment register in any way possible. It doesn’t matter how. Then this cruel government can say that the unemployment figures are down. The truth of the matter is is that they aren’t down. They are higher than ever. People forced onto workfare or the work programme are taken off the unemployment figures amd the companies concerned get a nice sum of money for this pleasure. Workfare is another evil. It takes away paid employment and replaces a fully paid job with someone working for nothing. They make false promises of “you might get a job at the end of it” but that is very rare. Why? It’s simple. Why pay someone when you can get someone to work for nothing. Some people go into these workfare positions with hope… But that soon goes when they realise that they were being used. Does it make them feel angry? Yes it does and they are right to be angry. Does it make them feel like giving up? Yes it does.. You loose all self worth. You know that you are being used. Then the Jobcentre blame you for not getting paid employment. Even though it’s not your fault. You did your best to gain employment but the intention was to never give you employment. The Jobcentre then punish you with attending the work programme again, where the company receives a large amount of money for you attending. The longer you are there the more money they get. When you don’t find employment through them they will then put you on a gruelling punishment of daily signing on appointments. Taking away your prose and the ability to look for real work. A young man I spoke to yesterday who had always had a very good job and has a very high IQ said “I’m angry because they are treating me like an idiot. They want me to do things that Im overqualified for. It’s so frustrating.” They want you to be completely controlled by them in such a way that your life isn’t your own. Another young girl the same age as my daughter came over to chat with me with her boyfriend. They’ve had no money since November and are relying on the one homeless facility for food. They look so thin and sad. They are only starting their life’s and shouldn’t be like this. I really hope that we can help them in some way. I’m still hopeful for them. I have to be we can’t give up hope. We also got some very bad news. The PCSOs that we talk to on a regular basis had just got back from an incident where a man had tried to hang himself. He attends Ashton Jobcentre and we probably know him. They aren’t allowed to say much but you could see the shock in their eyes. We hope that he recovers. It really upset us all. Will the Jobcentre take responsibility for this? No they won’t. Of course they are only doing their jobs. I say again I know where ive heard that before. It was vey uplifting to see all the demonstrations up and down the country yesterday. We now know that people are in solidarity with us. For a long time we have felt alone in our quest to highlight how wrong sanctions are. And there were some fantastic demonstrations. I heard a comment yesterday that someone was disheartened because lots of people didn’t turn up. We don’t get lots of people except on special demonstration days that I create. It’s not about numbers it’s about quality. About you being there showing support to the claimants inside the Jobcentre. They have hope that there is someone outside that cares. It keeps them going. Even if it’s just one person protesting it’s enough. Don’t give up more people come the longer you are there. ﻿﻿ ﻿﻿ ﻿ Keeping this blog and the Jobcentre demos is very hard work and time consuming. It’s taken over my life. I’m trying to put a donate button on here but I’m struggling with this. I need to pay for my internet to keep this going and a donation however small would be so fantastic. If anyone could help me with setting up a button on here please message or comment. I do have a PayPal account also. Many thanks I would love to continue blogging and writing it’s become my whole life and will be so until this evil stops! On probation, sanctioned and hungry and the case of the invisible man. Comments from bystanders at today’s impromptu demonstration. (Balls has said so in The Independent). for voting against austerity cuts. The poor now outnumber all other voters in the UK, but especially in England. Cornwall has single figure vote rates that brought the sitting Tory or Lib Dem MP into their job and yet the poor voter outnumbers all other income level voters. cannot get sufficient votes to form a majority government. The Tories are planning to sit tight and rule in parliament, even if their Tory MPs lose their seats. This is the Gordon Brown scenario. The Lib Dems are the gone party, who lost worse than any party in a former by eleciton, losing their deposit like some micro party and not getting even 400 votes. So if you are poor, a victim of welfare and state pension reform, aka abolition, come out and vote on Thursday 7 May for different parties, especially in England. Because the poor can unseat Tories and Lib Dems, more than any other general election in UK history, this year. A group of parties reaching 323 MPs will put the Tories out of power and passing the laws that threaten lives every day. What is the purpose of the regime of sanctions, workfare schemes and the whole punishing slant of the increasing conditionality attached to claiming welfare support these days? The mainstream press, in general, fill the canvass of public opinion with negative “benefit cheat & scrounger” stories; whilst trumpeting the favorite political mainstream mantra of the “hard working family” or hard working “tax payer”. But, what is all this about? Many of the stories you might find published in the press are fabricated, taken out of context and in any case, even where a grain of truth is present, only representative of a tiny minority of welfare recipient. Also, in comparison to the eye watering sums involved in Corporate tax avoidance and high level fraud, not even qualifying as a drop in the bucket. I grow sick of hearing normally reasonable and intelligent people parroting the right wing, divisive shite spewed from the bowels of the DWP and their numpty Ministers. I am not religious, but if I was, I would now be praying to the vengeful god of the fallen walls of Jericho fame to pay Westminster a visit real soon ….. I don’t know if you’ve checked this. You most likely have. Anyway, here’s instructions for adding a “donate” button. As soon as you’re set up I’ll pass it on. I know some very like-minded people in Ashton who might be up for a bit of activism and support. This is about as much as I can do from Norfolk at the mo. I hope one day that I will be able to change that. Meanwhile back at my roots in the North West, the current state of affairs is driving people to despair. 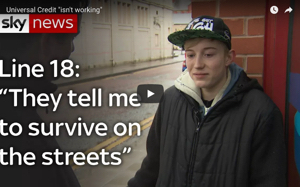 A young couple living on no money, a man has attempted suicide and been attended by PCSO’s… Yep, not paid police officers, but the volunteers they are relying on to plug the gaps made by more cuts. People feel unable to speak and have a right to be mortally angry. If you’re in Ashton Under Lyne or anywhere in Greater Manchester and suffering. Look at the work this lady is doing and be inspired not to sit there and take it. You CAN fight and you MUST fight, because those in power will ignore you. Try and fail if you must but do not sit there and let it happen. You are human beings and you do not deserve it. If you can’t get out of the house write blogs. If you don’t have the internet, write letters and ask a friend to buy you some stamps. If you don’t have friends, message me and I’ll send you some! But do not be silent. If you need help, there are people who care. We’re here.